Some Thing in the Water is an enormous underwater light and audio installation. This groundbreaking work is a collaboration between Post Typography and PI.KL Studio with sound design by Post Typography partner Bruce Willen. 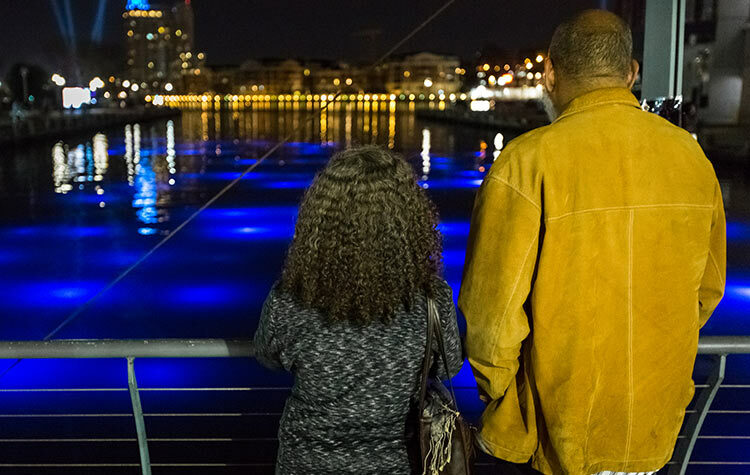 Some Thing in the Water was first installed in the Baltimore Inner Harbor for Light City 2018, a free festival of light, music, and innovation. This 25,000 sq. ft. programmed light installation suggests a mysterious underwater world filled with luminescent creatures. Where much light art is designed to dazzle, we took a more subtle approach. The harbor’s brackish water diffuses the hidden LEDs, making the entire body of water our canvas. Organic light programming paired with a rumbling, ambient soundtrack brings the harbor to life and creates a truly surreal, otherworldly experience. The six scenes explore motions and moods that range from spooky to frenetic to meditative in a 15-minute cycle. 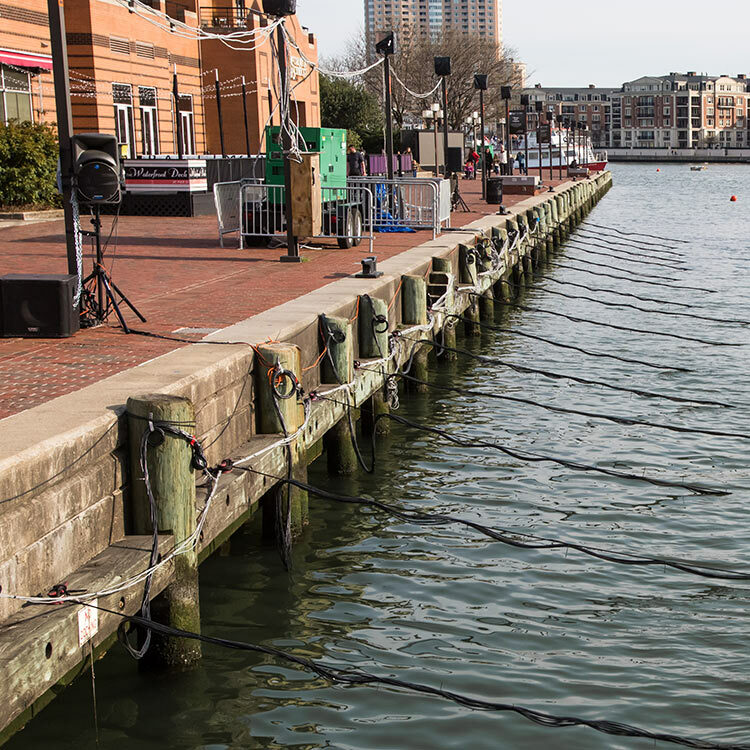 Many of Light City’s 470,000 attendees watched our piece from the bridge and adjacent piers. While the harbor isn’t yet swimmable, activating the water allowed audiences to imagine a future where luminescent creatures really do swim through the city. Some Thing in the Water provides iPhone-friendly moments for the casual viewer, but rewards those who devote greater time and attention to the piece. Discrete cabling and audio infrastructure recede in the dusk, creating a more seamless and magical viewing experience. Our portable command center is wired with pixel-mapped LED controllers, running Figure 53’s QLab to play the light animations and audio. 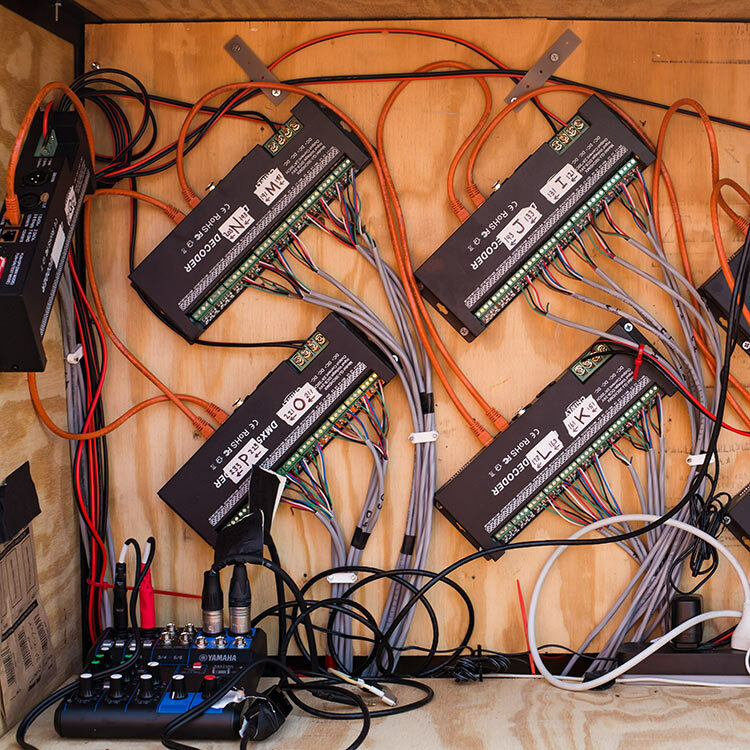 Over five miles of low voltage wiring strung across the channel support an organic grid of lights, connected to our control station. Constructing the project took dozens of volunteers and hundreds of man-hours. 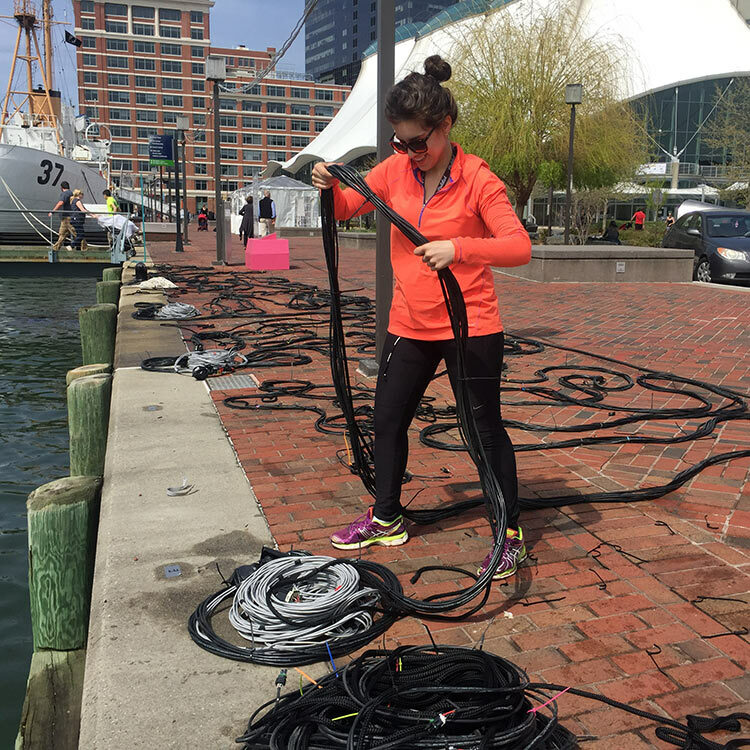 This herculean effort had our team stripping wires, zip-tying football-field-long coils, waterproofing LEDs, assembling thousands of parts, and learning new software. It was truly a learning experience, but the result and an overwhelmingly enthusiastic audience speak for themselves. need some thing that makes a splash?